Fish & Other Creatures — Masterson's Garden Center, Inc.
One of the best parts of owning a pond is the opportunity to watch your fish grow and mature in your carefully crafted ecosystem. Here is a bit of info on the aquaculture offered at Masterson's. Standard Koi (Cyprinus rubrofuscus) also known as Nishikigoi are derived from carp. Originally from China, these Carp were kept as a form of aquaculture in rice paddies over a thousand years ago. The notorious Japanese Koi were first bred around 1820 where selective color breeding became very important. Today there are hundreds of color schemes ranging from dark blue and black to bright golds, whites and reds. In addition to being very colorful, koi are very hardy and cold tolerant freshwater fish which makes them the perfect addition to decorative water gardens. They grow to about 36" in length so be sure your pond can accommodate fish of this size. They have a life expectancy of about 40 years in captivity, so be sure to pick koi that you'd like to look at for a while! Koi seem to brighten everyone's day as they develop their own personalities, and become accustomed to human interaction. 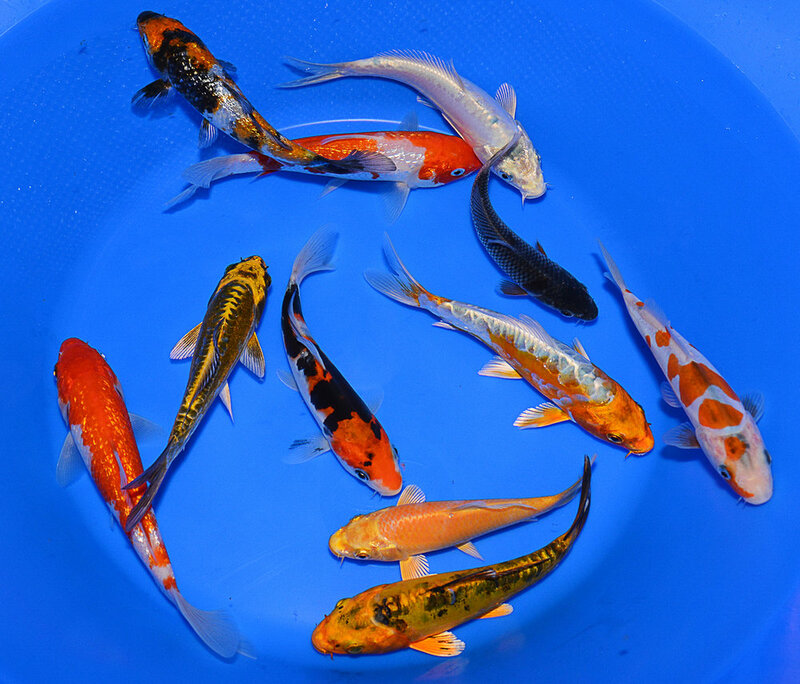 Butterfly Koi also know as dragon carp, are essentially the same as what we call standard koi in shape, behavior, cold hardiness and virtually all characteristics. However, they have long flowing tails and pectoral fins. These fish are truly gorgeous when they reach adulthood resembling angels floating around your pond. Though some do not consider them to be "true" Nishikigoi, they are an absolutely beautiful addition to your water garden. Butterfly koi come in all the same colors as the standard koi and grow just as large at 36". Comet Goldfish are friendly little fish that thrive in a water garden ecosystem. They are quite a bit smaller than koi, reaching only about 10"-12" when full grown, making them a better option if you have a smaller pond. They are insect eaters, so in still bodies of water they serve as an excellent natural mosquito larva control. Goldfish are a good cold hardy fish for the northeastern U.S. and can live happily in your pond for up to 14 years. Sarasa Comet Goldfish have the same physical characteristics, life expectancy, cold hardiness, diet and temperament as the Comet Goldfish. The only difference is their color. Sarasa comets offer a sharp red and white pattern compared to the flat orange Comet. American Bullfrog Tadpoles are much larger than tadpoles of other frog species. They are dark green in color resembling that of the adult American Bullfrog. Unlike most other tadpole species, these can take 1-2 years to fully mature. Though adult Bullfrogs are predatory carnivores, the bullfrog tadpoles are herbivores grazing on algae and small plant life in their ecosystem. Frogs and tadpoles are cold blooded but they can survive our winters in the water garden. They lay still at the bottom of the pond, preferably dug down into the muck a bit, and occasionally swim around to intake oxygen. Trapdoor Snails are freshwater gastropods which like silty and muddy environments. Female snails can live up to 5 years and males 3 years. They tend to reproduce like crazy in the pond ecosystem. Though they are exclusively algae eaters, they are not a reliable source of algae control in a large ecosystem like a pond. However, they do exhibit one behavior that is beneficial to the pond owner. In the event of a water quality issue they will close up their trap door, giving the pond owner plenty of warning before the fish start floating.